AutoSpeed - Pushrod Six Power! Turbo and nitrous-boosted 4.1 litre six - with cast pistons! Most racers stick to a tried-and-proven formula when building a 9 second car. You buy a thoroughly R&D’d car (such as a Holden VL Turbo), add 'X' turbocharger, 'Y' valvetrain and 'Z' transmission. With a set-up like this, you’re onto a sure thing. But Anthony Briggs’ 1981 Cortina breaks new ground - no one has been here before! 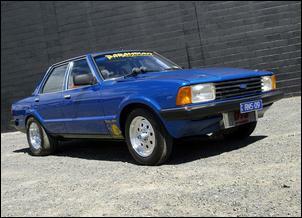 Anthony got stuck into modifying his Cortina back in the late ‘80s. At a time when bent-eight 308s, 350s and 454s were all the rage, Anthony went in his own direction and built fire-breathing carby turbo set-ups for the contemporary Ford straight-6. “I built turbocharged 3.3 and 4.1 litre sixes for the car and, although the 4.1 doesn’t rev like the 3.3, it has a big torque advantage,” says Anthony. “I ended up using a Holley 750 double pumper in a draw-through turbo set-up and the quickest time I ran was a 11.5 – using a 4-speed manual and slicks,” he says. 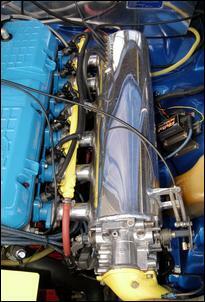 Anthony currently uses a Falcon XF pushrod 4.1 litre (250ci) six with an alloy head. The engine – developed in conjunction with Toowoomba’s Paramount Performance - was built with cast (yes, cast) ACL 9.0:1 pistons, shot-peened EA Falcon rods (which are manufactured by TRW) and ARP bolts. The crankshaft and block remain standard aside from being O-ringed to improve the sealing performance of a copper head gasket. 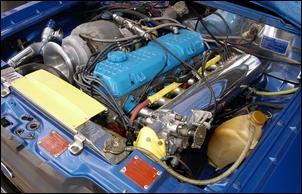 The valvetrain was spiced up with aftermarket pushrods, aftermarket roller rockers, screw-in studs and bigger valves. The 2-valve cylinder head was also subjected to a major port and polishing job which included careful shaping of the combustion chambers. The camshaft delivers 240 degrees of intake and exhaust duration at 50-thou lift. We’re told that the 4.1 engine – although immensely torquey – cannot handle high rpm operation. Despite the aftermarket valvetrain parts, it’s likely the pushrods and rocker gear would explode beyond 6000 rpm. As a result, Anthony up-shifts at just 5500 rpm – incredibly low for a drag car. Anthony is a pretty handy sort of guy and was able to fabricate the intake and exhaust manifolds. The current intake manifold uses internal ram-tubes, a large volume plenum and a Mazda RX-7 throttle body - which was chosen because it’s big and cheap. Anthony says he’s tested a few different intake manifold configurations and this is as good as any. 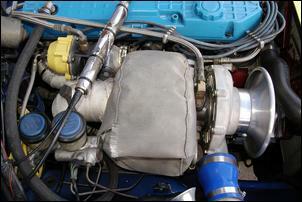 The exhaust manifold is the third different design intended to improve turbo spool-up. There have also been more than ten different turbochargers tried on the dyno. The current ball-bearing turbo is described simply as a “bitsa” and comes on at about 3200 rpm. This works side-by-side with a Garrett 45mm external wastegate. A single 3 inch exhaust is bolted on for occasional street use while a twin 3½ inch system is used on the strip. 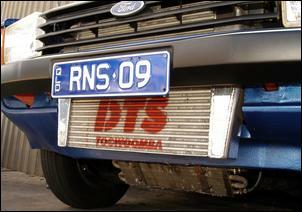 A big PWR air-to-air intercooler consumes the area behind the grille and reaches down as near as practical to the bitumen. 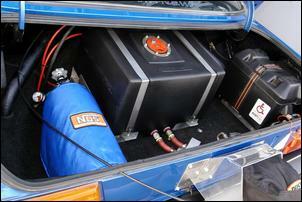 This photo also shows the transmission fluid cooler. A TurboSmart atmospherically-venting blow-off valve is installed near the turbo compressor outlet. No need for an air filter. Despite efforts to improve spool-up, Anthony finds it necessary to run a 40hp nitrous boost to help sprint off the start line. The car is held on the trans brake, the lights turn green and Anthony hits the nitrous. The gas injected into the intercooler plumbing prior to the throttle body and is deactivated when boost pressure reaches 12 psi. Fuelling the beast is a MicroTech LT8S management system working with Rochester 96lb injectors (fitted to a modified Ford XF rail), a Malpassi pressure regulator, twin 500hp pumps and an in-boot fuel cell. Ignition is taken care of by a Crane Hi-6 booster, high-energy coil, Magnecore 8mm leads and NGK plugs with a 7 heat range. One of the biggest challenges with the car has been finding a suitable torque converter to work with the tricked 2-speed Powerglide trans. We’re told that the engine makes so much torque they can’t find a torque converter that is capable of locking. 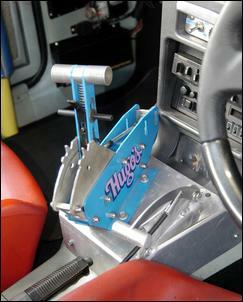 The current 3000 rpm stall converter slips even when it’s supposed to be fully engaged. 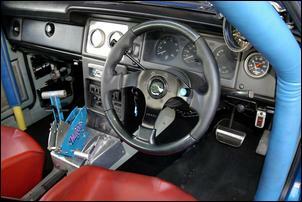 From the back of the transmission you’ll find a heavy-duty tailshaft that’s similar to those used in Pro Stock cars. This connects to a Mark Williams 9 inch rear running a 3.0:1 mini-spool centre and billet axles. Amazingly, the rear-end hasn’t been tubbed but the rear guards have been massaged to fit a set of 26 x 9 Hoosier drag slicks. And how much power is there at those big, soft treads you ask? Well, in the existing configuration, the car has spat out a humungous 560hp (418kW) at the wheels on Paramount Performance’s Dyno Dynamics chassis dyno. This is with 26 psi boost and avgas flowing through the injectors. The Cortina’s suspension is the focus of on-going development. Spring and damper rates are continuously being tweaked and the diff assembly is locked to the chassis. This helps the car launch evenly without a corkscrew action. Anthony says the front wheels pick w-a-y off the ground, but not quite enough to require wheelie bars. Brakes are Ford XB Falcon. 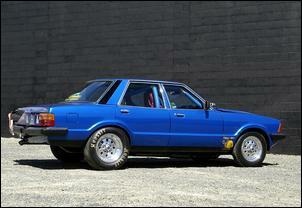 The body is standard 1981 TF Ford Cortina coated in Chev Z28 Camaro blue. 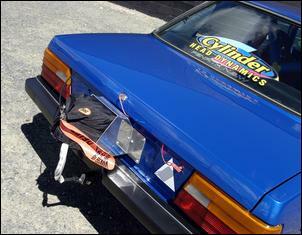 The only mods are a parachute, bonnet pins, nosecone cut-out for the intercooler and Cragar alloys. The kerb weight is almost 1500kg – there’s no avoiding the extra weight of the 9 inch diff, cage, turbo system and beefy rear wheels. At the time of writing, Anthony and the team at Paramount Performance were still fighting problems relating to the torque converter – but you wouldn’t know it given the car’s quarter mile prowess. The best time is currently a 9.63 second ET with a trap speed of 140 mph. Amazingly, the engine had remained completely intact (cast pistons and all!) for around 4 years. Unfortunately, the engine made its last roar shortly after our photo shoot – and in spectacular fashion! We are told that one of the pistons broke, punching a hole through the side of the block and causing oil to spew out from under the car – all while travelling at well over 100 mph! The mishap happened in the second half of a quarter mile run and when the oil got under the tyres Anthony was demoted from driver to passenger – there was nothing he could do to keep the Cortina straight. The car hit the wall causing damage down the entire right side of the body. On the upside, it’s all repairable and the car will re-emerge with a little extra something... Anthony has purchased a BA XR6 Turbo engine which will receive many of the bolt-ons currently fitted to the ol’ pushrod 4.1. According to Anthony, the BA DOHC engine should be able to rev about 1500 rpm harder than the existing engine – this will give the scope for more power and make it easier to sort the driveline. Now that’s a new formula! Anthony would also like to thank MTQ Engine Services, Performance Cylinder Head Dynamics, Keas Automotive, R&L Mullers and Paramount Performance.